A interactive journal can be used in any subject, and they help keep student thoughts on a subject organized and information in one place. Students are able to be creative, independent and reflective thinkers and writers. The journals should have a varied amount of methods in them, to keep the different intelligences of the child engaged. There has been little research done on interactive journals. The current outlook on what works with interactive notebooks is through the use of multiple intelligences and the mixture of right and left brained activities. There is no one right or wrong way to do an interactive journal, while there are methods to help keep accuracy and effectiveness, there is not a set method that seems to work best. 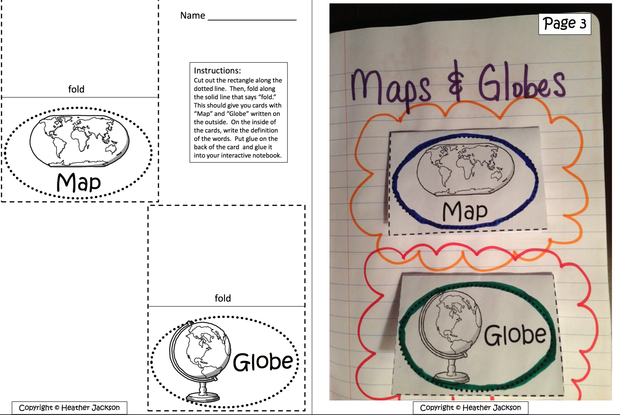 The use of an Interactive Journal is a strong way to engage the different intelligences. The right side of the pages, should be used for teacher given exercises, these exercises should be used for assessment. These assignments should also target different intelligences. On the left side of the journal the students should be able to draw or write notes that help them make connections using their own words. Should have a table of contents so the students can go back and look up information at later points. The students need to know what is expected for each side of the notebook. 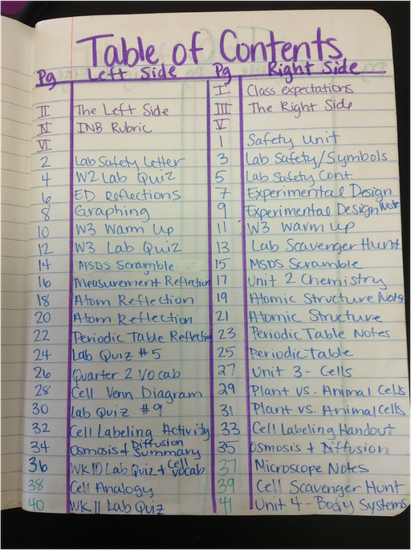 The students should have a guideline or rubric for each side of the notebook. 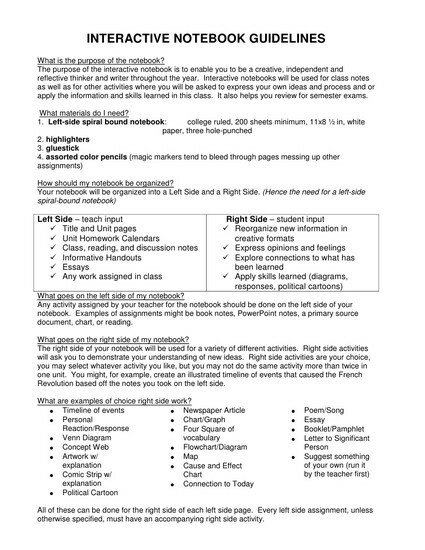 While the left side is not graded it should have some guidelines for the students to have ideas on what to do. The students should be given time to decorate the front of the notebook, this allows students to gain ownership of the notebook. The first page on the inside of the journal should be a title page this should have the students name, class name, and any pictures the students would like to add that relate to the subject. Key ideas through the journal should be marked with highlighting or underlining or putting a box around the word. Teachers should keep up with the journals along side their students, this is for students to see an example of how it can be done, and give different examples on both the left and the right sides of the page. Ultimately the students are the ones who should be benefiting from the journal. While it can make grading easier, the students are the ones who will benefit from learning in the various ways. It is important to remember that you know the differences in your class and what can work best, but it is also important to expose your students to all the intelligences or both left and right brained activities. These different activities help keep the whole brain learning. Helping your students stay organized and have a resource to go back and look up information is a great tool for them to use, and is also a great way for the students to build on their knowledge of what has happened in the class by looking through the journal and remembering the different activities.